The Russian Academy of Sciences member and Princeton University professor has been awarded the Abel Prize for "fundamental contributions to the theory of dynamical systems, ergodic theory, and mathematical physics." 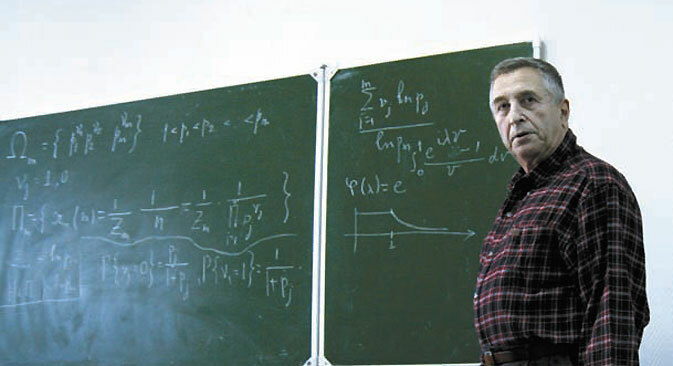 Russian mathematician Yakov Sinai, a researcher at the Institute for Theoretical Physics of the Russian Academy of Sciences and professor at Princeton University, has been awarded the Abel Prize, which is one of the most prestigious awards in mathematics. The award was given to Sinai "for his fundamental contributions to the theory of dynamical systems, ergodic theory, and mathematical physics." "Sinai discovered unexpected connections between order and chaos and developed a way to apply the probability theory and measure theory to study dynamical systems," the Norwegian Academy of Sciences said in a statement. The Abel Prize is named after the famous Norwegian mathematician Niels Henrik Abel (1802-1829). He was the founder of the theory of elliptic functions and made a significant contribution to the theory of infinite series. In 2002, in honor of the 200th anniversary of the birth of Abel, who died at age 26, the Norwegian government allocated 200 million kroner (about $34 million at current exchange rates) to establish the Abel Prize Fund and Abel Prize. The prize was established to not only celebrate the achievements of outstanding mathematicians, but also to increase the popularity of this scientific discipline among young people. The prize amount is 6 million Norwegian kroner ($1 million). "His achievements include pioneering work in ergodic theory, the study of the tendency of dynamical systems to go through all possible states in accordance with certain laws, and in statistical mechanics, which examines the behavior of systems consisting of a very large number of particles, for example, gas molecules." According to representatives of the Abel Committee, which consists of five internationally recognized mathematicians, much of Sinai's research has become part of the standard toolbox for mathematical physicists. Russian mathematician and Fields Medal winner Stanislav Smirnov, who is one of the committee members, said in an interview with news agency ITAR-TASS that he and his colleagues had a difficult task this year. According to Smirnov, Sinai "also influenced many people who were not his students; he essentially influenced several generations of mathematicians." The mathematician himself said that every paper he published has been important to him. "You know, every paper is very dear to me," said Sinai, speaking on the Rossiya 24 TV channel. "I spent a part of my life on every paper. Imagine that you have twenty children, and you are asked which child you like the most. Could you answer a question like that? Probably not. It's the same with my research." The official awards ceremony will be held on May 20. It is expected that the Sinai (78), who works at Princeton University and the Landau Institute for Theoretical Physics, will receive the award from Crown Prince Haakon Magnus, the heir to the Norwegian throne, and in the following days will give a series of lectures in Oslo and Stavanger. Yakov G. Sinai was born in Moscow on September 21, 1935. He studied at the Mechanics and Mathematics department of Moscow State University (MGU), from which he graduated in 1957. He was a student of the famous Soviet mathematician Andrei N. Kolmogorov. Since 1960 Sinai has taught at MGU, and since 1962 he has worked at the Landau Institute for Theoretical Physics. He has been a professor at Princeton University since 1993. Sinai's major contributions are in mathematics and mathematical physics. Based on material from ITAR-TASS, Interfax and Vesti.ru. Read more: What awaits Russian science?